One book, both sides shown. One side, see Fred flip over and over. Flip the book over and see Daielma's ribbon dance! We use Dube juggling equipment. Note: Shipping is included for US orders. Prices in US funds. 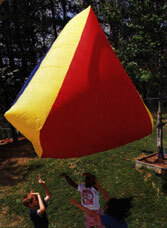 Float-R Inflatables were created by Fred Garbo and designer George York. Learn more about the performers of Fred Garbo's Inflatable Theater Company. "A wildly entertaining balleto-pneumatic show that melds art with aerodynamics and leaves the audience howling in its wake." See even more of Fred Garbo's Inflatable Theater Company pieces on video.